Lisa has been the Administrator at Grafton Oaks since 2005. Her dedication to Grafton Oaks is not only evident by the many years of leadership and service she has provided but by the personal level of care and concern she has for her residents and staff. 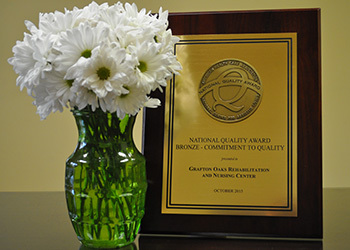 During her tenure as Administrator, the facility has twice been recipient of the “Top Work Places in the Miami Valley,” had two deficiency-free surveys by the Ohio Department of Health, been recognized for three years running by CMS and been reported in US News as a facility ranking in the top 20% in the country, and we have received the Bronze and Silver National Quality Awards by the American Health Care Association.